My printer CLX-3305W says "Prepare new imaging unit". Does this refer to the imaging drum (ref CLT R406)? Yes, the CLT-R406 is the correct imaging unit for the Samsung CLX-3305W printer. We keep buying cartridges for our Samsung CLX-3305W printer and don't know what to do with the empty cartridges. Have you any suggestions? I'm just sorting out an order to buy some more. Also, have you any special offers or discounts? Just a query as to when the Samsung CLX-3305W value pack cartridges will be back in stock? The 4 colour Samsung CLX-3305W toner value pack is now back ink stock and is currently available to buy with free delivery. The network-ready Samsung CLX-3305W wireless colour printer allows users to print directly from their mobile phones or tablets. This multifunction unit can do more than print images and documents; it is also capable of scanning and copying. It has a maximum resolution of 2,400 x 600 dpi and it can deliver 20,000 pages per month. 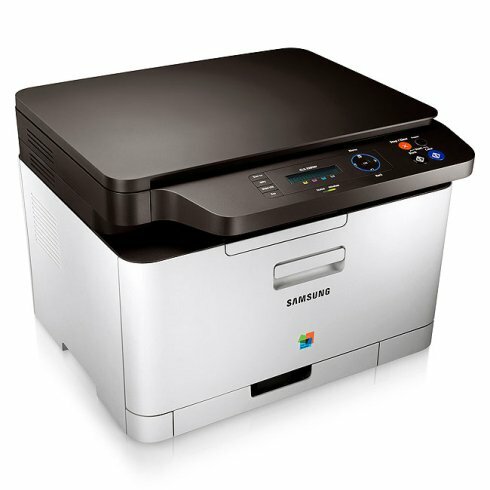 The Samsung CLX-3305W 3-in-1 multifunction printer is compatible with Windows, Linux, and Macintosh operating systems and it offers both Ethernet and Wi-Fi connectivity. The CLX3305W colour laser printer also has a USB host. Print speed for coloured output is very slow. The compact CLX 3305W printer features an ergonomic design and has a cube-like form that measures 406 x 362 x 288.6 mm. It also has a flatbed scanner and a 150-sheet paper cassette. The Samsung CLX-3305W wireless all-in-one laser printer has a print speed of 4 ppm for coloured with the first page coming out in 26 seconds or less and 18 ppm for monochrome. The control panel features an LCD display plus navigation and function buttons including a one-touch eco mode. Users can directly print photos from their mobile phones through the Wi-Fi or from their thumb drives through the USB host. Along with easy mobile printing, the Samsung CLX-3305W wireless printer offers Ethernet connectivity for easy networking. This reliable unit can continuously copy up to 99 pages and it delivers good scans and prints, too. Scan to PC, application, and USB can be done with the Samsung CLX-3305W colour printer. Savings can be made on Samsung CLX-3305W toner by purchasing a set of all four cartridges from a discount online shop. Unlike other all-in-one units, the Samsung CLX-3305W colour multifunction printer does not have a fax machine This multifunction printer also lacks handy features such as an automatic document feeder and an automatic duplexer; double-sided printing can only be done manually.